New possibilities and intuitive insights arise from this state of emotional healing. For over 20 years, people from all over the world have traveled to see Dr. Jeffrey Thompson in his sound therapy clinic. Dr. Thompson has pioneered the use of music and sound to help patients reconnect with their own natural source of healing. 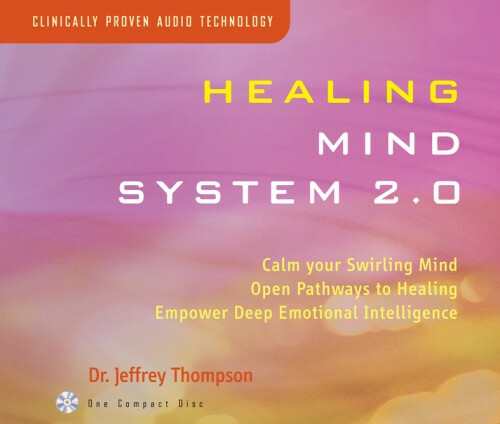 The Healing Mind System 2.0 works by blending inaudible pulses of sound that mirror the brainwave pattern of the healing mind state into a soothing musical soundtrack. As you listen, your own brainwaves begin to reflect this same powerful brainwave pattern, drawing you easily into this restorative state. Simply play this program in the background during other activities, or listen more attentively while practicing the visualization and meditation techniques included in the enclosed booklet. Review for Healing Mind System 2.0 Review by Benjamin B.